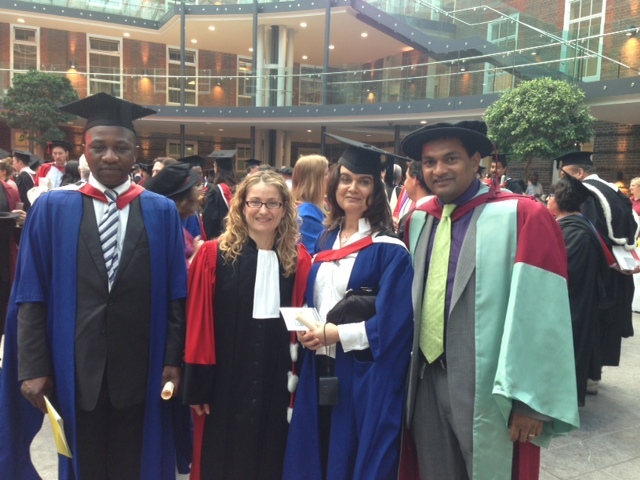 The graduation ceremony of Middlesex University School of Law was held on Wednesday 17 July. It is always a special occasion for students, their families and staff. This one was even more special for me as the first participants in the MA Human Rights and Business graduated. The School of Law stuck to its great tradition of granting honorary doctorates to individuals with strong human rights backgrounds. After Shami Chakrabarti (Director of Liberty) in 2011 and Fatou Bensouda (Chief Prosecutor of the International Criminal Court) in 2012, Michael D. Higgins, the current President of the Republic of Ireland, is now a doctor honoris causa of the University. In the picture from left to right: Abraham Nahr of the Norwegian Centre for Human Rights and currently a PhD student at Middlesex; me; Sanne Borges, Senior Adviser on Business and Human Rights at Amnesty International Denmark; and Professor Joshua Castellino, Dean of the School of Law.